Before his Surprise Saguaros wrapped up their Arizona Fall League season with a 2-0 win in the league's championship game, Red Sox prospect Garin Cecchini was honored with the Dernell Stenson Sportsmanship Award on Saturday. The award is given to the player who exemplifies the hard work, leadership and humility that former Reds outfielder Stenson demonstrated before his death in 2003. 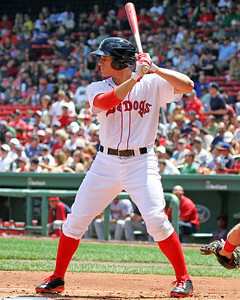 Cecchini was the first Boston prospect to receive the award since its inception in 2004. The five other finalists were Andy Burns (Blue Jays), Travis Mattair (Reds), Jonathan Meyer (Astros), Devon Travis (Tigers) and Cory Vaughn (Mets). The award is named after former Red Sox outfield prospect Dernell Stenson, the system's top prospect in 2001 according to Baseball America, who was tragically killed in 2003 while playing in the AFL as a member of the Reds organization. Cecchini has displayed unselfishness from day one of his professional career. Upon signing a $1.31 million bonus as a fourth-round pick in the 2010 draft, Cecchini donated $20,000 to the Jimmy Fund. He has also given money to churches in Louisiana to aid in their mission work in Nicaragua, whose orphans have also received baseball equipment from the Red Sox farmhand. For more on Cecchini's past largesse, see D.J. Bean's article on WEEI.com. Cecchini is comparable to Stenson in more ways than one. Stenson was a top-100 prospect three times during his tenure in Boston's system and reached Double-A Trenton two seasons after he was drafted in the third-round of the 1996 draft. Cecchini, a high school draft pick like Stenson, was promoted to Portland in mid-June this season after batting .350/.469/.547 in 262 plate appearances with Salem. He spent 2011 and 2012 with Lowell and Greenville, respectively, after not playing in 2010. Cecchini played in 18 games this fall with Surprise, batting .277/.434/.338 with four doubles. The third baseman tied Rays prospect Richie Shaffer for the most walks in the AFL with 17. Kevin Pereira is a Staff Writer for SoxProspects.com follow him on Twitter @kevinrpereira.